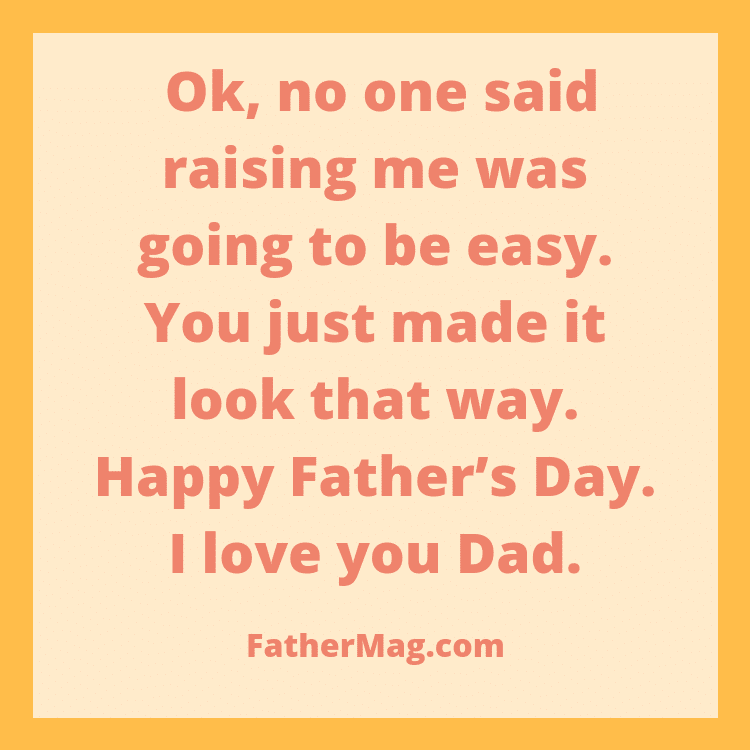 Every year fathers are given one day to be appreciated for the things they do for their children. 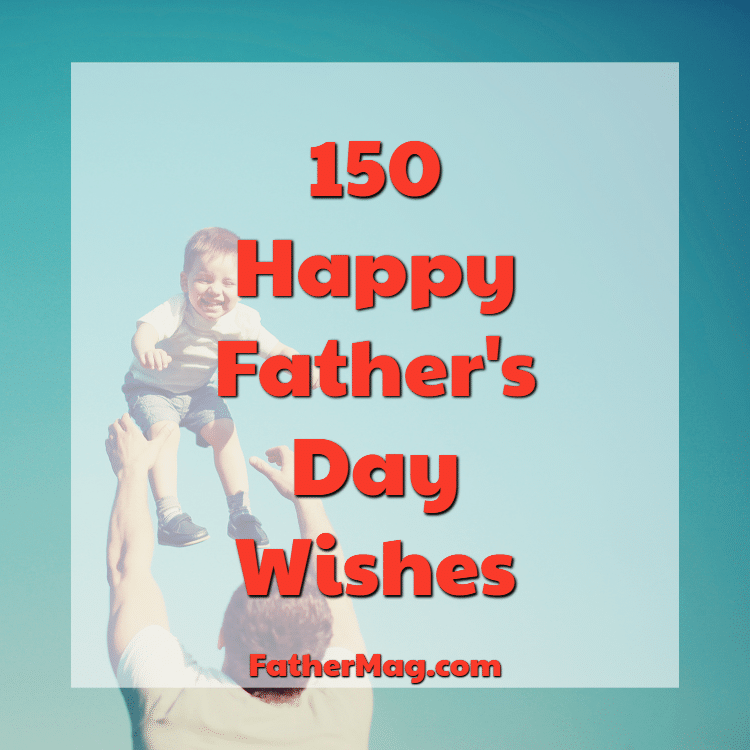 If you can’t come up with something meaningful to write and don’t know how to express your gratefulness and love for your dad, these below mentioned wishes may help. Take a look at this compilation of Father’s Day wishes we prepared for you and find the one that resonates with you. You can copy them word for word or you can get an idea to write your own Father’s Day wish. Good luck and enjoy reading! 1. Dad, you are my hero and my role model. Thanks for being here for me and being a great example. 2. Happy Father’s Day. You’re not just my father, but one of my closest friends. 3. You’re my one and only dad, and I’ll always have a special place in my heart for you. Happy Father’s Day. 4. You will never go out of style. Happy Father’s day to the coolest dad ever. 5. The older I get the more I realize how important it is to have a dad like you. You have provided stability in my life and the love and acceptance I needed. Happy Father’s Day. 6. Thank you for being there every day with just the love and guidance I’ve needed. Everything you’ve taught me has stuck with me and I’m lucky to have a dad like you. 7. Dad, you have given me the best things in life: Your time, your care, and your love. I am truly grateful to have you in my life. Happy Father’s Day. 8. There’s no possible way I could pay you back for all that you have done for me growing up, but I greatly appreciate all your hard work raising me. I wouldn’t be who I am today without you. 9. For all the wonderful things you do that I might not always notice, thank you. 10. It’s that time of year again when everyone tries to tell themselves that they had the best dad in the world. I really did have the best dad in the world, so they can’t be right. 11. Thank you for all the ways you go above and beyond every day for our family. The kids and I are so lucky to have you. 12. I’m so grateful to be sharing life, love and parenthood with a wonderful man like you. 13. I can’t imagine anyone who’s a better father or more loving husband than you. 14. You give our children someone to admire, respect, and honor. You are a fantastic dad. Happy Father’s Day to my loving husband. 15. You are so full of compassion, love, and strength. When we need a strong hand of support in our family, you are always there. I love you for being who you are and for all that you do. Happy Father’s Day to a wonderful husband. 16. We are so lucky to have you in our lives. I am so proud of the father you’ve become and the wonderful husband you are. Happy Father’s Day, my love. 17. 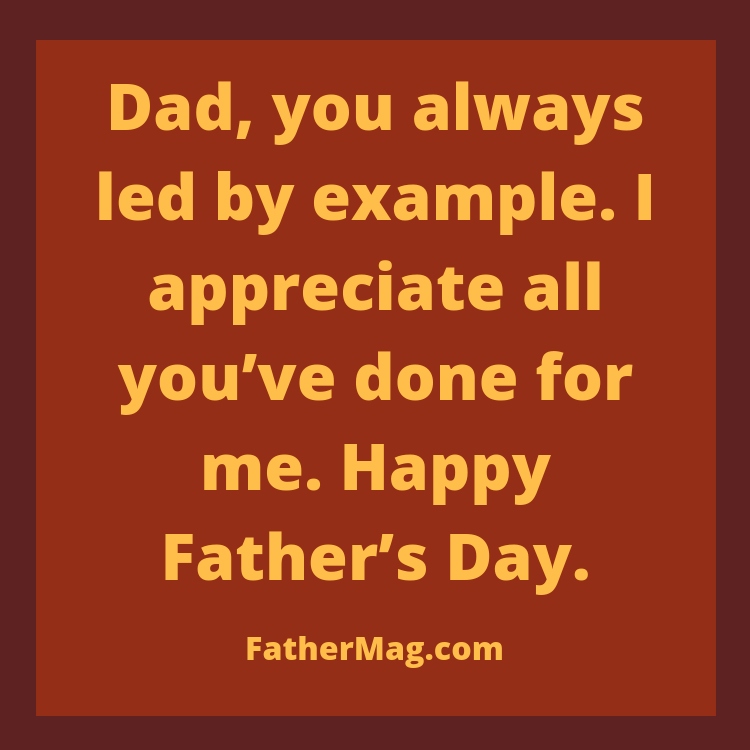 Thanks for being a loving father to our children and always being there for us when we need you the most. I couldn’t have asked for a better partner in life. Happy Father’s Day. 18. One day is not enough to honor how special of a father you truly are because you are amazing every day of the year. Thank you for all that you do. I love you. 19. I can tell from how your kids act that they feel happy and totally loved. Of course, they do. They have an awesome dad. 20. I always knew you’d be a great dad someday. Happy Father’s Day to my favorite brother and a father whose irreplaceable to his kids. 21. Not only are your kids lucky to have you for a dad. I was lucky to have you for a brother first. Happy Father’s Day, Bro. 22. I always knew that you’d make a fantastic dad. So glad to say I told you so. Happy Father’s Day. 23. To my dearest brother, you are such an amazing father to your wonderful kids. I hope you spend today doing something you’ve always wanted to do. 24. Happy First Father’s Day. Being a father is the most important job a man will ever have. 25. Wishing you all the special discoveries of fatherhood – the wonders, the joys, and the love that keeps on growing for a lifetime. 26. Even though this is only the beginning, it’s easy to see our baby loves you just as much as I do. Happy Father’s Day. 27. Wishing you a Happy First Father’s Day as you enjoy the infinite love and gifts of fatherhood. 28. Though Father’s Day is a special day, this year it means more because now you’re there among the best dads that Father’s Day is for. 29. Ok, no one said raising me was going to be easy. You just made it look that way. Happy Father’s Day. I love you Dad. 30. Dad, who else would have taught me how to golf, eat pizza for breakfast and play poker. 31. Dad, you were the first one to make dark socks and sandals look cool. You fashion icon, you. 32. Thanks for pretending you liked the polka dot socks. Happy Father’s Day. 33. To the world’s greatest dad – ok, the sample size is limited, but I think you’re very deserving. 34. How is a baby bird like its dad? He’s a chirp off the old block. 35. Hopefully this Father’s Day will provide you as much fun as before you had kids. 36. Dad, thanks for showing me how to play baseball. Don’t read too much into the fact that the few times I got to play it was in right field. 37. I’d like to apologize for all of your gray hair. Genetics. That’s my story and I’m sticking to it. 38. I take some comfort in knowing that in my younger years, I set a family record for time outs — signed, your #1 (son or daughter). 39. Dad, you work so hard, you need a vacation from all life’s stress, demands, and overbearing egos I’ll try to get out of the house for a while. 40. Dad, You’re my favorite parent. If you tell Mom, I’ll deny I ever said it and you know who she’ll believe. 41. Dad, You’ve always done what’s best for me even if I didn’t understand it at the time Which isn’t to say I understand it now, either, but I’ll take your word for it. 42. On a father scale of 1 to 10, I give you a million. Thanks a million, Dad. 43. Hats off to the greatest father ever. 44. Thank you, Dad, for everything. 45. A father is someone you look up to no matter how tall you grow. 46. I have to salute you Dad for my Hollywood good looks. The nut doesn’t fall far from the tree! 47. Dad, you’re the best banker I ever knew. 48. I hope I’ve made you proud, Dad and if not, hey, maybe you ought to lower your expectations. Happy Father’s Day Daddy. 49. We share a love of sports that’s brought us closer, especially if we shove the recliners together. 50. Dad, I notice in your wallet you have photos where your money used to be. 51. If at first, you don’t succeed, call Dad. 52. If you look up magnificent dad on Wikipedia, you’re photo and bio show up. Go figure. 53. I love that we have a silent agreement that I’m your favorite kid. Why spoil it for the others? 54. Dad, you’ve always given me everything I wanted. Either that or you’re very good at convincing me what I want. 55. You’ve always been a great father to this girl. Thanks, Dad. 56. For the guy who does it all, and then some. Thanks, Pops. 57. The greatest gift I ever received was having you as a father. 58. I’ll always be Daddy’s girl. 59. We have so much in common Like Mom, for instance. 60. You’ve always provided that needed shoulder to lean on. Happy Fathers Day. 61. The Checklist: Recliner – Check. Remote – Check. Chips – Check. 62. Hugs and love for the big guy from his loving daughter who owes him so much. 63. I am honored to be your daughter. 64. You’re appreciated and loved more than you know. 65. 1. Me 2. Your family 3. Everyone who recognizes kindness, caring, and generosity of spirit. Just a short list of the people whose lives you’ve touched. 66. You’re a father and a friend. Happy Father’s Day Pops. 67. I am so fortunate to be your son. 68. You’ve always inspired me. 69. Congrats Dad. I turned out amazing. 70. Dad, you always led by example. I appreciate all you’ve done for me. Happy Father’s Day. 71. Like father, like son so, do I get out of chores today too? 72. For all the great advice, I wouldn’t have it any other way. Thanks, Dad. 73. The best teacher I ever had always lived right in my own house. You’ve taught me so much. Thank you. 74. Feeling so blessed to be your son. 75. When I think back of the sacrifices you made, I realize how fortunate I am. Thanks, Dad. 76. I can always count on you for so many things, thanks, Dad. I’m very grateful. 77. May all the love you give to others come back to you. 78. My hero, my helper, my friend, my dad. Happy Father’s Day. 79. My strength and my friend, I am today what I have become because of you. Thanks, Dad. 80. No one ever thanks you for all of the little things that you do. The roof over our head, lights in the hallway, and boogey-man free closets. I love you. 81. Thank you for being someone that I can always count on and always turn to. 82. Thanks for being there when I need you the most and even when I didn’t. 83. I appreciate you’ve given me the best things in life: Your time, your care, and your love. 84. Thanks for giving me the finer things in life your time, your care, your love. 85. There aren’t enough words in any language to express how much I love you. 86. This is your day, but don’t let me disturb you. It’s best to let sleeping Dads lie. 87. Being my dad has meant a lot of invested time, energy, and money. You are a generous father and I love you. 88. I hope you know that I am grateful for having such an awesome dad. Happy Father’s Day. 89. I’m wishing a great and fun day for a great and fun dad. 90. Thank you for providing stability and protection for our family. I feel safe knowing you have my back. 91. I am overwhelmed by a sense of gratitude on Father’s Day because I am blessed to have you as my dad. 92. I hope this Father’s Day is as happy and special as you made me feel as my father growing up. 93. Do as I say, not as I do. Have a Happy Father’s Day. 94. Kick back and relax today. You may not get another day to relax before next Father’s Day. 95. I look up to you, but one day I may not be able to if I get taller than you. 96. I like to think that God gives boys fathers so they can learn how to be men, and God gives girls fathers so they can know how they should be treated by men. 97. Thank you for showing me love just as our heavenly father shows us love. 98. God gave me the dad that He knew I would need. And He gave you the child He knew you could handle. 99. Your faith in God and your love for Him is why I am inspired by you and respect you. 100. Your wisdom is built upon the everlasting and omniscient guidance of our heavenly father. I am blessed to have your influence in my life. 101. I know that you know our heavenly father as well as I know you. 102. Throughout the Bible, there are accounts of blessings being passed down through fathers. I am blessed because of you being my father and because of who our heavenly father is. 103. Thank you for teaching me the most important lesson in life. Thanks for teaching me what it means to be a Christian. 104. God gives boys fathers so they can learn how to be men, but God gives girls fathers so they can know how they should be treated by men. 105. If I could write in your card, I’d tell you how great of a dad you are. 106. Even though I’m small, I can tell I take up a big part of your heart. 107. I’m glad I have a dad who is big and strong like you. 108. Thank you for helping mommy take care of me. I don’t think she would be able to handle all the work by herself. 109. You are my superhero because you can make me fly, you are super strong, and you give great hugs. 110. You’re the best, Dad. I love you. 111. Dad, you’re in all my favorite memories. 112. Dad, you’re still the one I think of first when I have a question about something or when I just need some support and good advice. Thank you for always being there for me. 113. Happy Father’s Day to the man who taught me how to step and throw, how to field a grounder, how to follow through and pretty much every other important thing I know about baseball and living. 114. Happy Father’s Day to the man who put the fear into all my homecoming and prom dates and who still treats me like a princess. 115. You taught me so many of the important things I know including a few choice words for certain situations. 116. Thank you for being there every day with just the love and guidance I’ve needed. 117. You’re my one and only dad, and I’ll always have a special place in my heart for you. 118. God gave me such a good gift when he gave me you for a father. 119. You made growing up fun. 120. Thank you for the example you set and for your leadership in our family. We love you, Dad. 121. We could never hide how much we love you, Dad. Not even in a duck blind with camo on. 122. With you, Dad, Father’s Day means lots of tasty grilled things and lots for our family to celebrate. 123. So glad we all share such fun times together, Daddy. 124. We deeply admire the good man and wonderful father you are. 125. As a dad, as a father-in-law, as a grandpa, you’re the best, and we feel so lucky to have you. 126. This day is not about ordinary people. It is about special people like you! Have a great Father’s Day. 127. You carried me in your arms when I was little and held my hand while I was growing up. Dad, I am going to be your pillar when you are old and I will carry you in my heart until I die. Thanks for everything. Happy Father’s Day. 128. A dad is someone who wants to catch you before you fall but instead picks you up, brushes you off, and lets you try again. 129. Thanks for being there through thick and thin, through my tears and laughter. Happy Father’s Day. 130. On Father’s Day, I can’t help reflecting on all the things you’ve given me and lessons you’ve taught me over the years. Although time and distance may separate us, the man you are and the person you’ve made me never diminish. I hope you have a wonderful day, Dad. 131. Dear beloved father I don’t have any words to explain my love for you. Just want to say, you made my life. Happy Father’s day. 132. To my Dad on Father’s Day: You are my keeper of secrets, slayer of closet-dwelling monsters, tear dabber, boo-boo kisser and all around hero. I love you. 133. When I think of the word father, I think of many positive qualities. You are the reason I have such a great image of a father in my mind. Happy father’s day. 134. Happy Father’s Day. We’ve shared a lot over the years, dad. And if there’s one thing you’ve taught me, it’s to always make time to savor the special moments with the ones you love. 135. Happy Father’s Day. I may not ever fill your shoes completely, dad, but if I’m half the man you are someday, at least I’ll know I’ve tried. 136. Happy Father’s Day. You’ve always gone above and beyond for me, dad. On your special day, I wish you all the love & happiness in the world. 137. Happy Father’s Day. You’ve always had the biggest heart, dad. I’ve learned so much from you: patience, kindness, strength & courage. I love you so much, today and always. 138. Happy Father’s Day to the best Dad in the world. No matter how old we get, you’ll always be our first love. Have an amazing celebration. 139. Happy Father’s Day. You’re more than just the Grill Master in our family Dad…you’re also the Joke Master, the Plumbing Master, and well, basically you’re super masterful at being a Dad and we sure love you a lot and appreciate all you do for us. 140. Happy Father’s Day. To a Dad who’s patient, loving, dedicated, hard-working, generous and hilarious, yep, we’ll drink to that. Cheers to you. 141. Happy Father’s Day. Dad, you’re the kind of guy who’s always ready to lend a hand, or cheer a person up with a good laugh. We really love that about you. Now, why not take some time to enjoy your favorite brew and kick back and relax for once. 142. Happy Father’s Day. It was a wild ride raising us, Dad, but look how we turned out! Clearly, you did great! Thanks for putting up with us and loving us so well. We don’t know anyone else who would have been up for the job. 144. Best Dad. HAPPY FATHER’S DAY. I’d be lost without you in my life, Dad. Thanks for showing me the world and giving me the tools I need to navigate it. Love you tons. 145. Life has given us a wonderful family, a happy home, and love for each other. Most importantly, it has given us each other. I am so grateful to have you as my husband. Happy Father’s Day. 146. You are so full of compassion, love, and strength. When we need a strong hand of support in our family, you are always there. I love you for being who you are and for all that you do. Happy Father’s Day to a wonderful husband and father. 147. One day is not enough to honor how special of a father you truly are because you are amazing every day of the year. Thank you for all that you do. I love you. 148. You give our children someone to admire, respect, and honor. You are a fantastic dad. Happy Father’s Day to my loving husband. 149. Happy Father’s Day to the man of my heart, the father of our children, the love of my life. I love our family and I love you. 150. Father’s day is the only day where I gift a gift to the biggest gift of my life. Happy Father’s Day Dad. 151. Thanks, Dad for being the best plumber, the best electrician, the best mechanic, the best painter, the best driver, the best doctor, and the best teacher for us and our neighbor’s children. 152. As a Dad, you gave me the greatest gift by believing in me. As a Son, I want you to give the gift of being my friend on Facebook. Happy Father’s Day, Dad. 153. Do you think I am too old for a piggyback ride? If yes, then me staying out late night won’t be a problem, right? Ok, thanks, dad. Happy Father’s day. 154. I chose to give you a card this time as I thought the neighbor kids you compare me to must be bringing you a gift or something. Happy Father’s day, dad.